Learning Beyond Borders - Kyrgyzstan Ever dreamed of riding through the steppe on horseback? Well, Kyrgyzstan (pronounced ker-giz-stan) - now known simply as the Kyrgyz Republic - is all that and more! "Jailoo" is what the Kyrgyz call the summer pastures where nomad families move their yurts and livestock during the warm months for grazing. Because water is needed for livestock as well as human survival, most jailoo are located surrounding major lakes and are plenty green! This makes them perfect not only for the nomads who move to then during the summer months, but also for the explorer in search of new experiences and fun. Hope you like horses! Horses are a prized part of central Asian nomadic culture and good rising skills are essential on the steppe. Kyrgyz, like their Kazakh, Mongol and Tuvan brothers, are skilled riders and pride themselves on their horsemanship. A popular sport is Kyrgyz buzkashi, a game played much like polo with a few substitutes; instead of a ball, a goat carcass with the limbs sawed off is used - oh, and no sticks, you have to use your hands to maintain control of the "ball". I guess it's more like polo, capture the flag (or goat), and kill the carrier all in one. Kumiz is another quintiscencial part of Kyrgyz culture - other varities of this potent drink exist in Mongolia, Kazakhstan, Tajikistan and Siberia - but are all made the same way as far as we are concerned - out of fermented mare's milk. Kumiz is essentially a "milk beer", slightly alcoholic, definitely sour and foul smelling, kumiz is what you will be offered by the bowl full and not allowed to refuse in nomads' yurts. Dairy defines the diet on the steppe, even beer is made from it - just try the vodka! There is, however, an upside to these friendly dairy offerings, and that is Qaimaq! Qaimaq is one of the most delightful food things on the steppe, a thick, slightly sweet cream added to bread is absolutely delicious, especially with some homemade black current jam! Ever dreamed of riding through the steppe on horseback? Well, Kyrgyzstan (pronounced ker-giz-stan) - now known simply as the Kyrgyz Republic - is all that and more! 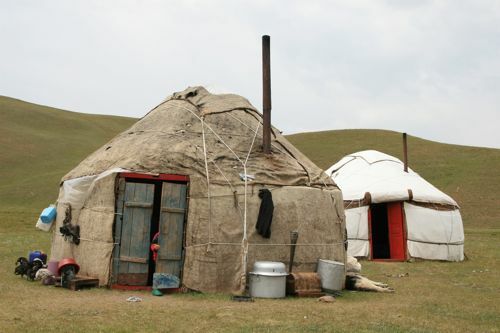 "Jailoo" is what the Kyrgyz call the summer pastures where nomad families move their yurts and livestock during the warm months for grazing. Because water is needed for livestock as well as human survival, most jailoo are located surrounding major lakes and are plenty green! This makes them perfect not only for the nomads who move to then during the summer months, but also for the explorer in search of new experiences and fun. Hope you like horses! Horses are a prized part of central Asian nomadic culture and good rising skills are essential on the steppe. Kyrgyz, like their Kazakh, Mongol and Tuvan brothers, are skilled riders and pride themselves on their horsemanship. A popular sport is Kyrgyz buzkashi, a game played much like polo with a few substitutes; instead of a ball, a goat carcass with the limbs sawed off is used - oh, and no sticks, you have to use your hands to maintain control of the "ball". I guess it's more like polo, capture the flag (or goat), and kill the carrier all in one. Kumiz is another quintiscencial part of Kyrgyz culture - other varities of this potent drink exist in Mongolia, Kazakhstan, Tajikistan and Siberia - but are all made the same way as far as we are concerned - out of fermented mare's milk. Kumiz is essentially a "milk beer", slightly alcoholic, definitely sour and foul smelling, kumiz is what you will be offered by the bowl full and not allowed to refuse in nomads' yurts. Dairy defines the diet on the steppe, even beer is made from it - just try the vodka! There is, however, an upside to these friendly dairy offerings, and that is Qaimaq! Qaimaq is one of the most delightful food things on the steppe, a thick, slightly sweet cream added to bread is absolutely delicious, especially with some homemade black current jam!